Fluent Planner facilitates easier production planning at construction sites. Aimed at work supervisors, this tool increases the precision of work management and shortens work time. Traditionally, a preliminary worksite plan and weekly plans are completed using spreadsheet software. The problem is that the various plans do not interact, and viewing several weekly plans simultaneously is difficult. In addition, history data is hard to trace and prediction is difficult. 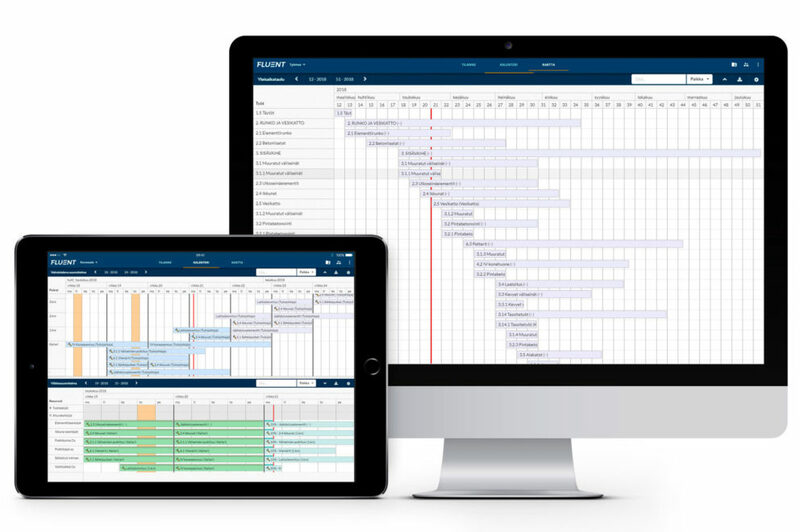 Fluent Planner improves the efficiency of planning throughout the worksite by collecting all weekly production plans into one system. The same view also includes a preliminary plan. Work tasks can be allocated easily on a PC or tablet screen. Visualisation makes it easy to see the larger picture and to modify plans accordingly. Would you like to know why things are not progressing at the worksite? Why work is being interrupted and the agreed schedule is not being met? When even the supervisor does not have all the facts, it is difficult to keep a project running smoothly. Fluent Go! is an easy-to-use data collecting application for easy recording of starting and ending of work and any interruptions. Data is transferred to Fluent Planner in real time, where problem areas can easily be identified. Planning and completing work tasks become more efficient when the duration of each work phase is known based on previous experience, helping to ensure that the same mistakes will not be repeated on later worksites. Fluent Planner is a production management tool for supervisors. The application increases the productivity of construction through more efficient and systematic implementation. The solution also makes it easier to keep to the planned schedule and to make difficult decisions. Don’t waste any more time on inefficient paperwork and searching for files – now all information can be found in the same application. Good planning also makes preparation easier and ensures trouble-free production. Historical data collected from previous worksites can also be used in the tendering phase of future projects. In addition to effortless production planning, Fluent Planner will save you time by helping to estimate the duration of work tasks and allocate resources. The application allows for adding conditions for starting certain work tasks and instructions, which enhances the quality of the work and helps ensure health and safety. Work phases and tasks can be bound to a certain location at each worksite. The easy-to-use application includes a lot of production data, such as conditions for starting the work and estimate on the duration of the work task. Clear PDF files can be printed out of completed plans to be displayed on the wall of the worksite cabin. Alternatively, the instructions can be displayed on screens where all workers can read them. Fluent Planner is a browser-based application that only requires a network connection to operate. The application can be used on a PC or a tablet computer, which makes it easy to use at worksites. Starting to use Fluent Planner is easy, and no long and tiresome training is needed to learn to use it.